The painting represents Jesus Christ being captured in the Garden of Gethsemane by soldiers who were led to him by one of his disciples, Judas Iscariot. Tempted by the promise of financial reward, Judas agreed to identify his master by kissing him: “The one I shall kiss is the man; seize him and lead him away safely” (Mark 14:44). 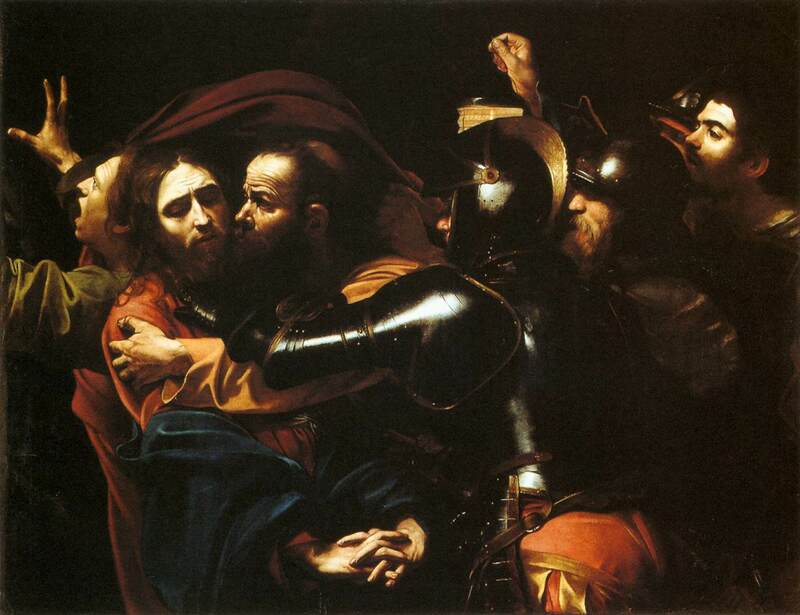 Caravaggio focuses on the culminating moment of Judas’ betrayal, as he grasps Christ and delivers his treacherous kiss. Christ accepts his fate with humility, his hands clasped in a gesture of faith, while the soldiers move in to capture him. At the center of the composition, the first soldier’s cold shining armor contrasts with the vulnerability of the defenseless Christ. He offers no resistance, but gives in to his persecutors’ harsh and unjust treatment, his anguish conveyed by his furrowed brow and down-turned eyes. The image would have encouraged viewers to follow Christ’s example, to place forgiveness before revenge, and to engage in spiritual rather than physical combat. Caravaggio presents the scene as if it were a frozen moment, to which the over-crowded composition and violent gestures contribute dramatic impact. This is further intensified by the strong lighting, which focuses attention on the expressions of the foreground figures. The contrasting faces of Jesus and Judas, both placed against the blood-red drapery in the background, imbue the painting with great psychological depth. Likewise, the terrorized expression and gesture of the fleeing man, perhaps another of Christ’s disciples, convey the emotional intensity of the moment. The man carrying the lantern at the extreme right, who looks inquisitively over the soldiers’ heads, has been interpreted as a self-portrait.